Terminator Genesys has a clever concept, sure, but it falls to live up to the highs of the series' first two installments. In terms of remakes, reboots and reimaginings, it's heart is in the right place. It knows Arnold Schwarzenegger's performances have been at the center of the series, and it rightfully places him in a renewed prominence after his absence from Terminator 4. What is so clever about the fifth Terminator film, is that is takes the classic Terminator formula and turns it into a full fledged time travel travel narrative with multiple time jumps. The first two entries were really just chase films with sci-fi dressing. This concept allows the main characters to visit the apocalyptic future, the 1984 timeframe of the original and the (more or less) contemporary now. Unfortunately, the film is a mess, and despite the fate of the world being in the balance, the stakes couldn't feel lower. The malevolent artificial intelligence known as Skynet is back up to its old tricks, and this time is set to gain consciousness at the arrival of a new cell phone operating system. When the original film was released, computers were still new, novel and at the height of the Cold War, scary. Now, Skynet kind of is here, and it doesn't want to destroy the world... it wants website clicks and micro-transactions. The film was smart enough to change the timeline of the Terminator series to make it work for a new generation, but it wasn't smart enough to completely morph what Skynet is, and what its threat to humanity could be. Yes, I'm worried that computers, self-aware or not, could accidentally launch a nuclear weapon. But I'm far more worried that the new operating system is going to give my personal data to hackers or erase an important, muli-page report that is due on Friday. 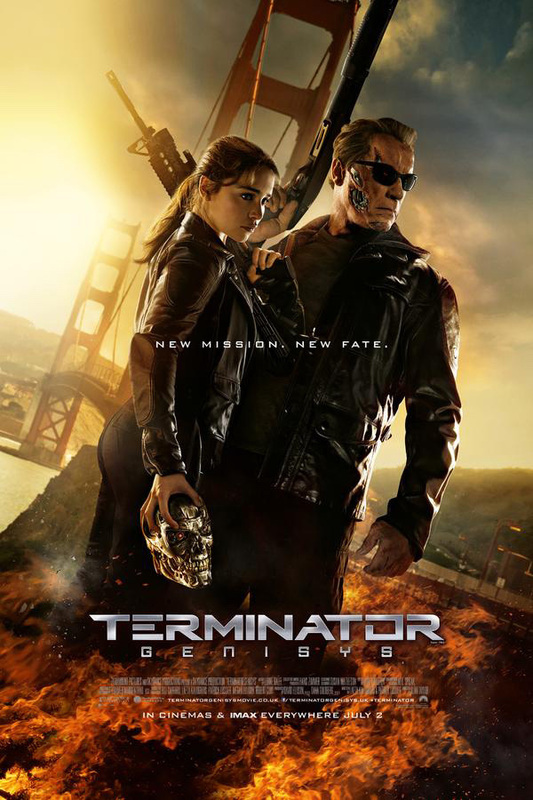 The most interesting character in the film is the iconic T-800 robot played by Arnold Schwarzenegger, referred to as the Guardian in the credits. He cannot time jump with human freedom fighters Kyle Reese (Jai Courtney) or Sarah Connor (Emilia Clarke), and there is something profound about a robot wandering the world alone, waiting for his makers to arrive. A missed opportunity. J.K. Simmons' alcoholic cop is also a highlight, taking the place of Earl Bowen's psychiatrist from the original as comedic relief. Overall though, the film feels bland and inert. Lead characters Sarah Connor and Kyle Reese have no character development. Reese in particular has all of charisma of a cardboard cutout, despite being the main protagonist. The "liquid cop" T-1000 Terminator appears seemingly only to shoehorn in an unneed reference to the second film. Several times the characters are seen driving in trucks and/or buses. Where are they going and why? It seems less important why characters do things than being able to set up another action sequence. Despite two Ellisons serving as producers, both heirs to tech icon Larry Ellison, T5 has nothing new to say about human/machine relations, and its paranoia is blasé in 2015, The Terminator series now has 5 films, a TV series, and countless video games and comic books. Only God knows which entries are cannon and which are not, and they have wild variances in quality. A really clever writer could tie everything together, but really who cares?